It had been a long time but the time for another Staggering Stories Jolly-Boys outing was upon us. The weekend before, Fake Crumbly and myself had been driving into Portsmouth for some retail therapy at Gunwharf Quays when we saw an advert splashed all over the back of a bus in front of us. 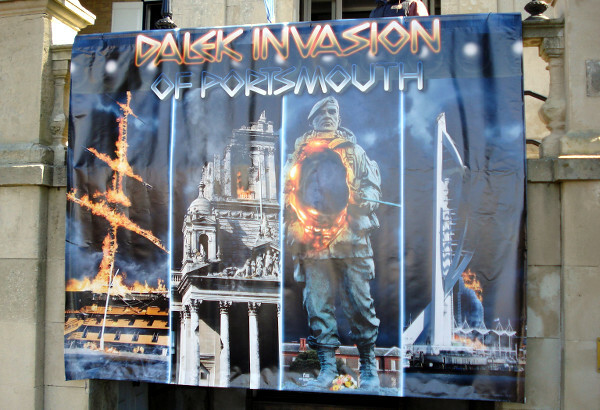 It was for an event called ''The Dalek Invasion of Portsmouth'' to be held at the National Marine Museum near Southsea Common. It was then that the seed of the next trip out took root and started to germinate. After what had to be one of the worst winters ever, April arrived and some decent weather at long last. It was the perfect day for sloughing off some of the many layers of winter clothing and shaking ourselves out of the collective torpor that envelops one and all during the winter months. I must say that the museum is a rather imposing place, to say the least. I suppose at some time in the recent past, it must have been a barracks for troops and also a training ground for the elite of the British Army. Parking up, we saw El Presidente Adam striding purposefully towards us, Head of Pertwee in hand. I think The Head must have known he was going to meet some friends, and enemies, old and new, which explained the rather anticipatory grin on his latex face. We knew we had arrived because the first things that we saw, apart from the very large marquee set up in the grounds, was a couple of animated scarecrows shuffling around waving their straw-filled arms at various people in the absence of The Doctors human persona that he was forced to assume to flee The Family of Blood.. Upon meeting up with the rest of the Staggerers, we made our way into the exceedingly spacious marquee, which at a rough guess, could hold a few hundred people seated with quite a few more standing around the periphery. Down the end of the marquee was a roped off area with a couple of large screens and partitions erected, presumably to conceal the daleks until they were called upon to make their appearance. A few minutes after taking our seats, the MC came on stage to announce that the 'guests' of honour would be coming on stage to make their introductions and to take place in a Q and A session. What happened next partially convinced me that I had fallen through a freak wormhole and into a parallel reality as what happened next was surreal, to say the least. 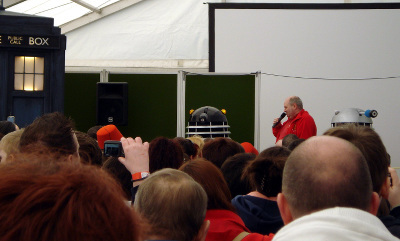 Holding a microphone up to the dome of each Dalek, the MC asked each Dalek what its name was. They answered: Spot, Bob, Phil and Dolly which pretty much set the tone for the session. Audience: “What do you do in your spare time? Audience: Where do you go on holiday? I couldn't help but point out that the actor who was playing The Doctor looked very similar to an actor who was in a recent episode called 'Cold War', portraying a Russian submariner, which featured a very cranked-off Ice warrior on board a Soviet submarine. However, I did recognise him from some pictures that the rest of the Staggerers took a few years ago at the very first Whooverville convention. 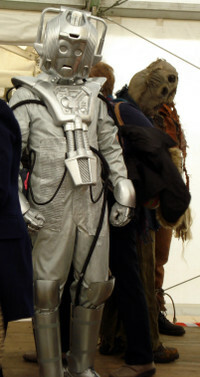 As is the wont with most Who conventions and get-togethers, there are a lot of fans who like to don fancy dress. I must confess that a lot of the costumes were finished off to a very high standard. Throughout the day, I could see a Peter Davidson-era Cyberman wandering around the grounds, happily posing for pictures with attendees. The only thing that let him down were the pair of trainers he was wearing that were sprayed silver to match the rest of his ensemble. 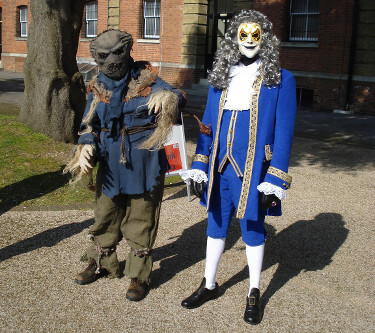 As I mentioned previously, there were a couple of 'Family of Blood' scarecrows lurching about, generally amiably menacing people and dropping straw everywhere they went and also a very convincing 'Girl In The Fireplace'-episode clockwork automaton, resplendent in his frilly shirt, French nobility wig and malevolently smiling harlequin mask. However, all credit must go to all the children who turned up in fancy dress. I remember a BBC video called 'More Than 30 Years In The TARDIS' that I have still tucked away in a dusty corner of my bookcases. One of the people who was interviewed was the singer Toyah Wilcox, who was fondly lisping on about a Dalek costume that she used to own when she was a little girl. She recalled that it was made of PVC and had all these interesting lumps and bumps on it that reminded her of fetish wear. Not a lot more can be said about that but there were a few kids there who were wearing Dalek suits that were in possession of rather flaccid-looking exterminating ray-guns....I do actually remember the scene with Toyah in the foreground fondly reminiscing while in the background, a small child wearing the aforementioned costume was wandering around rather blindly, bumping into furniture in what was supposed to be a mock-up of a 1960's sitting room. One costume that did cause me some confusion was one that a rather rotund lady was wearing. I wasn't too sure whether she was supposed to be a Dalek or a ladybird due to the spotted skirt that she was wearing or an Austin 7 with the pseudo- car indicator lenses that she was wearing on an Alice band on her hair. As you can tell from the title of this article, Dear Reader, Daleks in all their sinister glory, were rolling around, lording it up over everyone. All credit to those fans who built them during their spare time as they were very much labours of love. 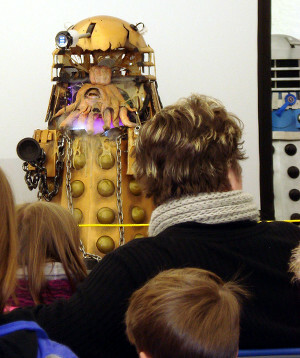 One that did raise a few eyebrows and the corners of mouths was one that was informally called Disco Dalek. Basically, it was a latter day Dalek with half its carapace blown away exposing the nasty little monocular glob inside. With LED's and lights dotted around inside it, it could move in all directions and the Kaled mutant inside could waggle its tentacles and move its eye from side to side. The LED's and lights inside it could flash randomly or in time to music, which it was doing for most of the afternoon. Unfortunately, the only song in its repertoire was 'Gangnam Style' by Korean pop star Psy. Nevertheless, it did not stop it from shuffling around in a rather jerky and staccato style, belching out clouds of dry ice and exhorting everyone within earshot, to do it Gangnam Style, in other words, pretending that you are riding an imaginary horse whilst twirling an imaginary lariat,.. In other words, looking like an idiot and making a complete t*t of yourself . By that time, our collective stomachs were starting to rumble so we decided to take a break for lunch. Myself, Fake Crumbly and the Dunns; real and fake went into the restaurant while El Presidente and Asda Man availed themselves of a burger stand adjacent to where the Dalek races were to be held. 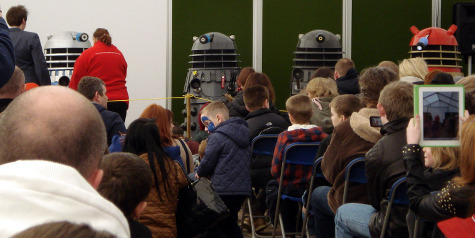 From what shouting and cheering we could hear, the Dalek races were both fun and chaotic at the same time. Both Adam and Scott confirmed this when they came into the restaurant to meet up with us. Fed and watered and ready for more, we made our way back to the marquee where the metaphorical walls of my sanity were to finally come tumbling to the ground. The first contestant came out onto the stage but couldn't sing as it couldn't see the writing as it scrolled up the screen. The second fared better as it gave a partial rendition on the song it was supposed to be singing. However, the third contestant beat them all plungers-down with a hearty rendition of The Proclaimers hit song '500 Miles'. Its singing voice, if it could be called that, was relatively clear and it even managed to slip in a few improvised lines about walking, or rolling, 500 miles to exterminate the Doctor. All too soon, it was time for the finale of the days proceedings with a massed trundle around the grounds of the museum. 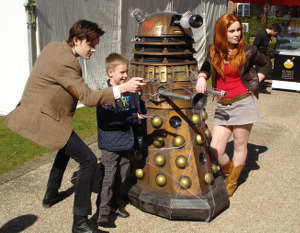 This occurred after the fancy dress contest had finished and it was time for every Dalek in attendance to roll out into the Spring sunshine and have its moment in the spotlight. 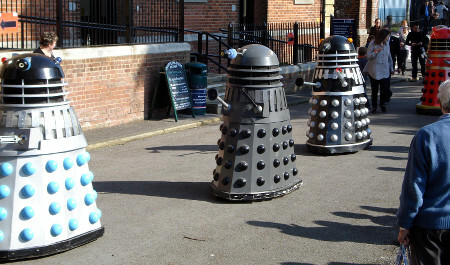 It was announced that the Daleks would set off in single file to proceed around the grounds and then reassemble by the main steps into the museum for the final photo shoot of the day. So off they all went, with an ever-growing retinue of kids and adults trailing in their wake, like metallic Pied Pipers on an afternoons constitutional around the grounds. It wasn't too long before they returned and lined up to take their accolades. 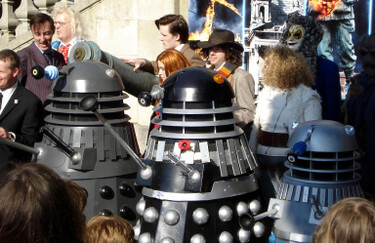 Aand what a sight it was, with the several Daleks that were in attendance that day at the front and numerous cosplayers, Doctors and their assistants, scarecrows, French Dandy automatons, UNIT officers, Cybermen and a host of others lining up behind, ready for their pictures to be taken.